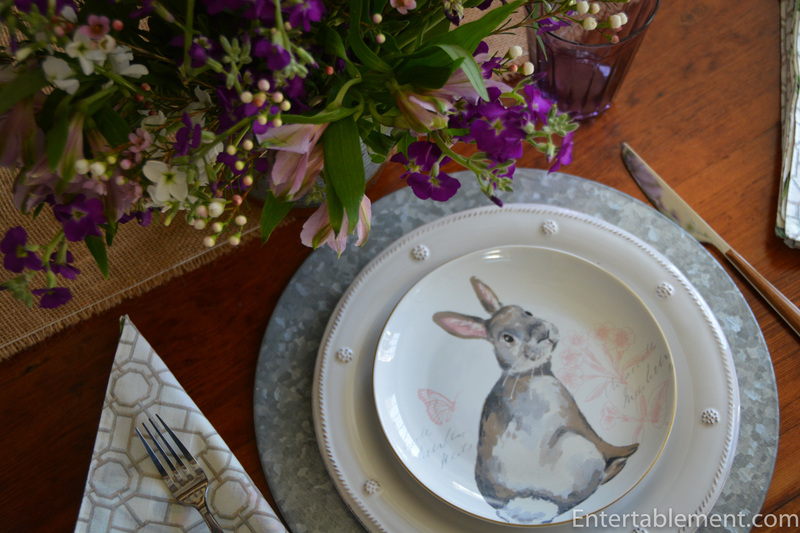 These whimsical rabbit plates by Pier 1 reminded me forcibly of Twix, a miniature Rex bunny belonging to daughter Lauren she was little. While I am the enthusiastic staff of dogs and cats, the parade of rodents that seemed to follow Lauren everywhere proved a challenging phase in motherhood. Her small furry friends ran the gamut from quite lovely hamsters each named Cuddly (I through IV), one rather aggressive brute called Arnold Schwarzenhamster, a few gerbils whose rapid movements drove the cats nuts and thus usually met a bad end, through to Ralph, the African Pygmy Hedgehog. Somewhat ironically, she now has a rather massive German Shepherd, called Rabbit The Dog. Go figure! This guy in particular looks very much like Twix with his diminutive and chubby person. Typical of Pier 1’s salad plate offerings, there are four different illustrations, all in soft shades of grey and brown, with touches of pink and pale blue. Then we have a wary bunny, with his ears lowered appeasingly. The last one is also upright, turned to look coyly over its shoulder. 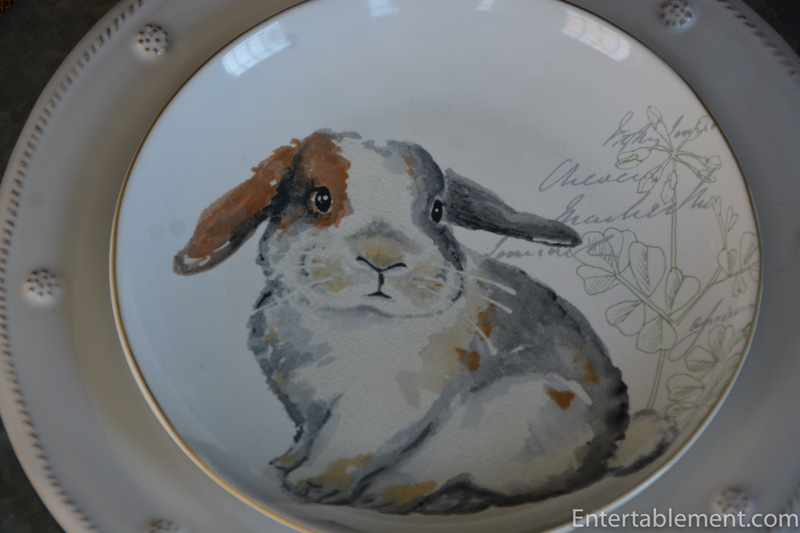 The artist has captured beautifully the slightly anxious and somewhat harried look rabbits always seem to sport. 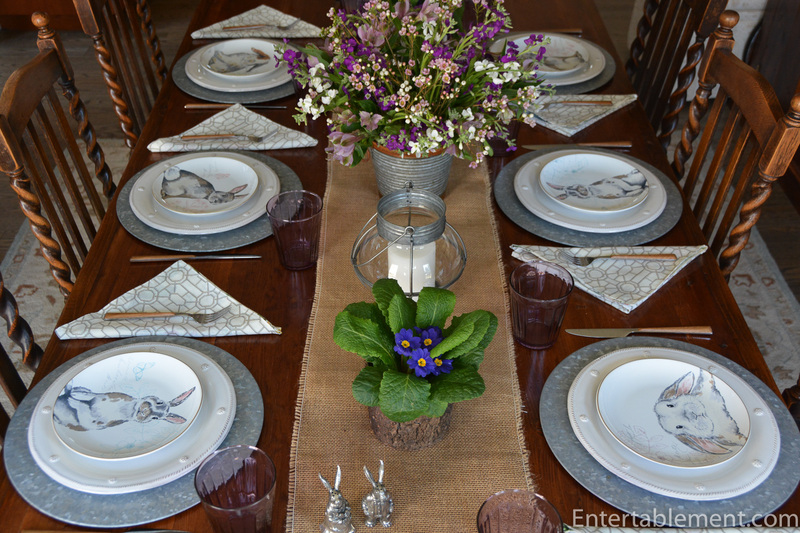 I stuck with natural/rustic theme for the table with galvanized chargers, wooden handled cutlery and a burlap runner. The napkins are the reverse side of a chinoiserie pattern I picked up a couple of years ago from Wayfair. The dinner plate is Berry and Thread by Juliska. 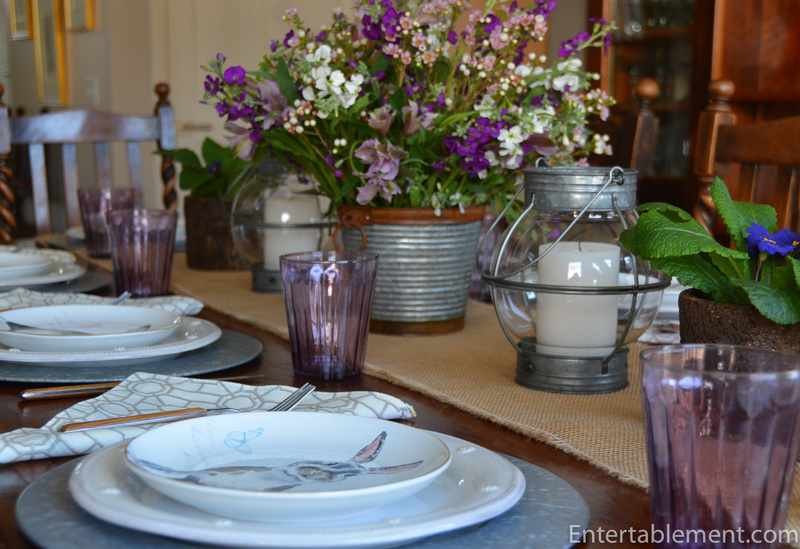 A galvanized container for a collection of wax flowers, stock and alstroemeria from Trader Joe’s and tin lanterns from Harvest of Barnstable continued the rustic metal theme. 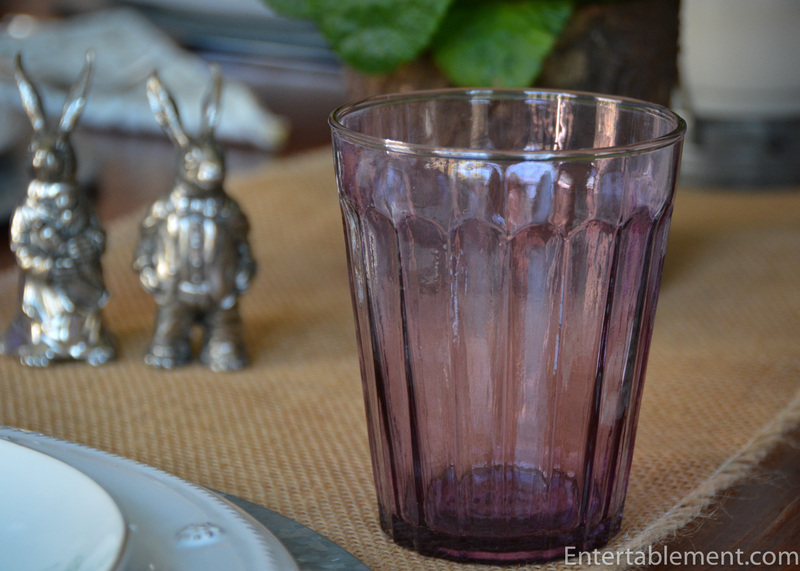 The amethyst tumblers are from Pottery Barn a couple of years ago. They’re generously sized and very practical. 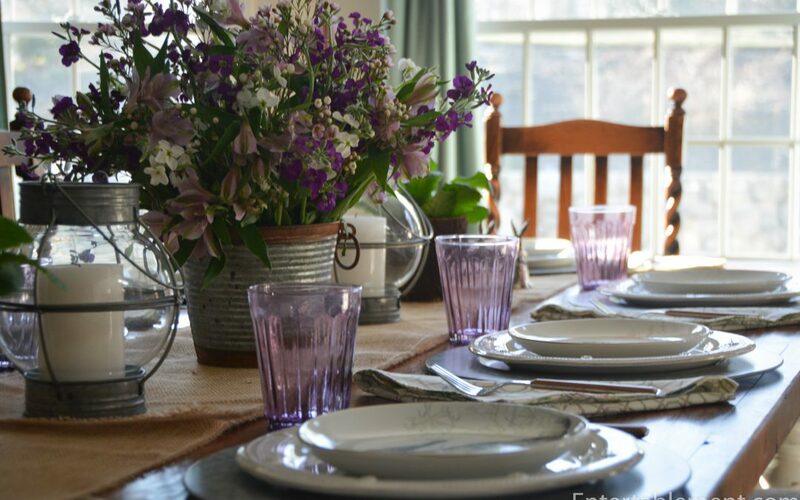 I really like the shade of lavender, which provides a touch of subtle oomph to the table. 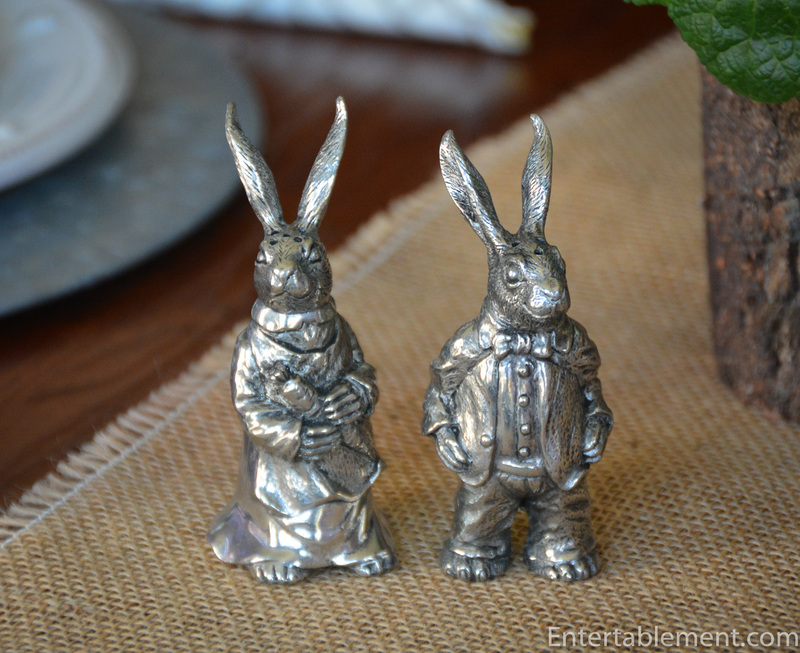 The “Dressed Rabbits” salt and pepper shakers are from Vagabond House. They add touch of formality and raise the tone, don’t you think? While the plates do not actually have lavender in them, I think the colour tones nicely with the pink and blue, and creates an aura of spring. 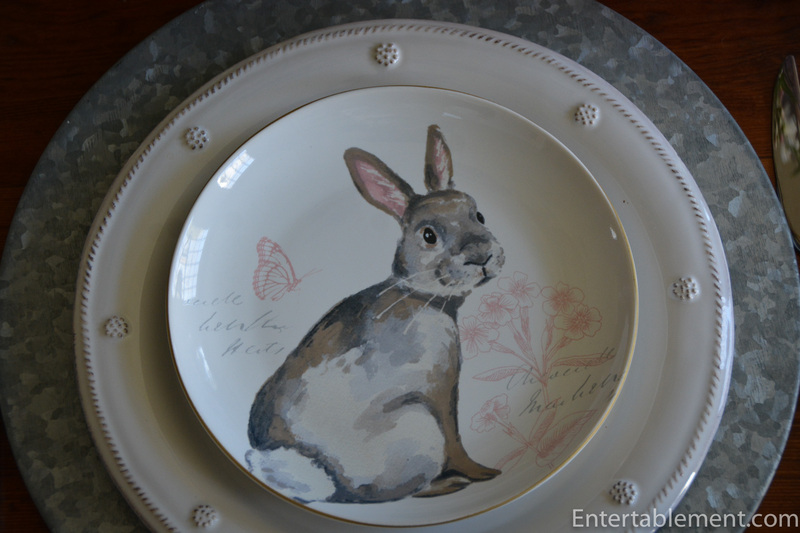 Bye the by, the rabbit plates are on clearance at Pier 1 as we speak. 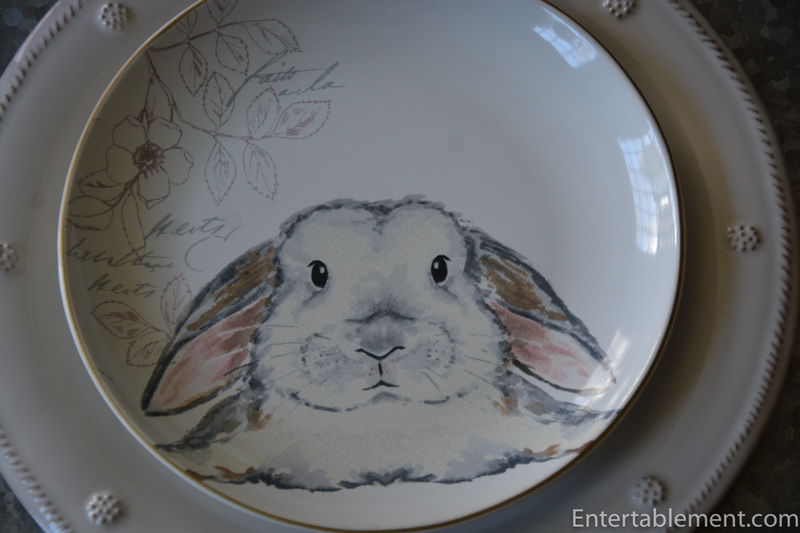 This is the second year they have had the pattern, and there is also a very cute dinner plate. What a charming table. We had rabbits after my daughter decided to show them in 4H. My sister was the one with daughter who loved rodents. I like the lavender glasses with the plates. 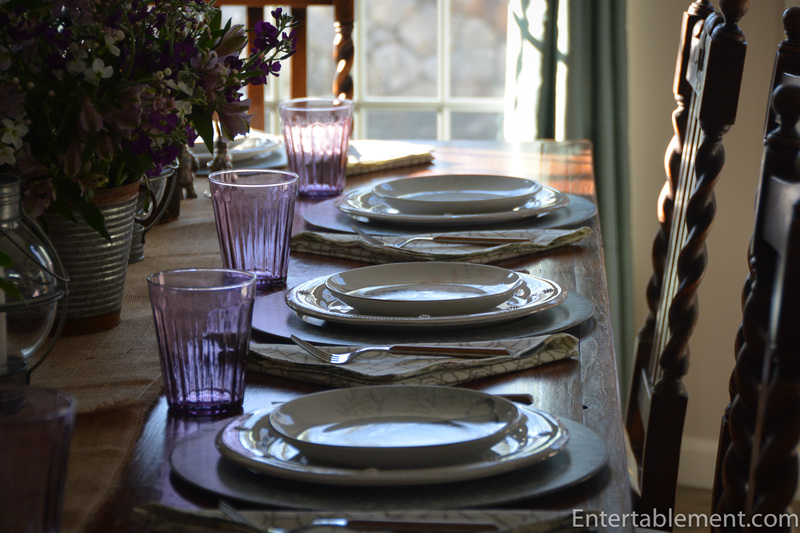 It may not be a color that is in the plates but it is the same color family as the purples in the centerpiece. Very nice. I couldn’t resist those rabbit faces 🙂 The artist did a great job capturing the “rabbit essence”, I thought. 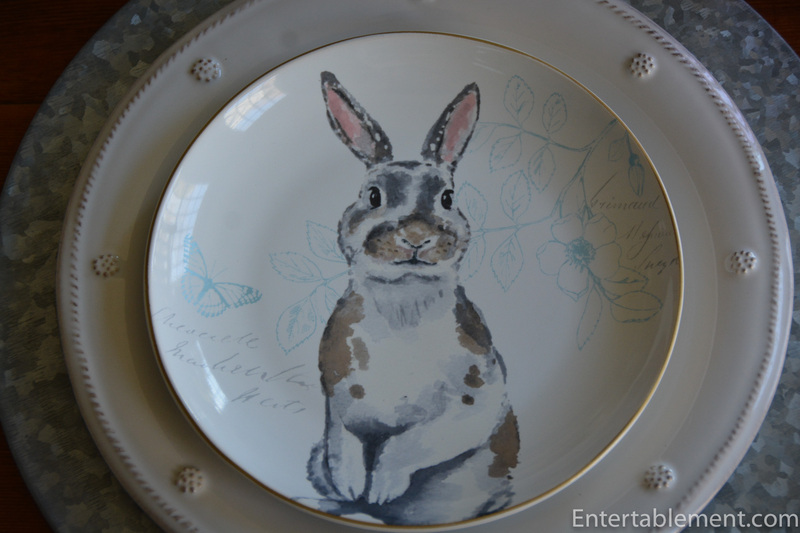 I have passed the plates on to daughter Kirsten to use at her house, as they fit right in with her colour scheme, and her little daughter loves bunnies. Have a great day, Lorri! 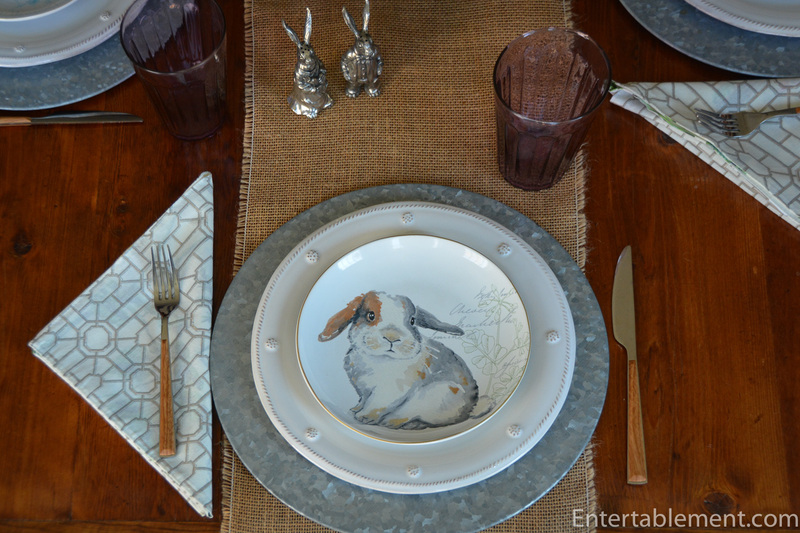 What cute bunny plates! And those lavender glasses are wonderful. I’d love to find some of those. Those salt and pepper bunnies are darling, too. 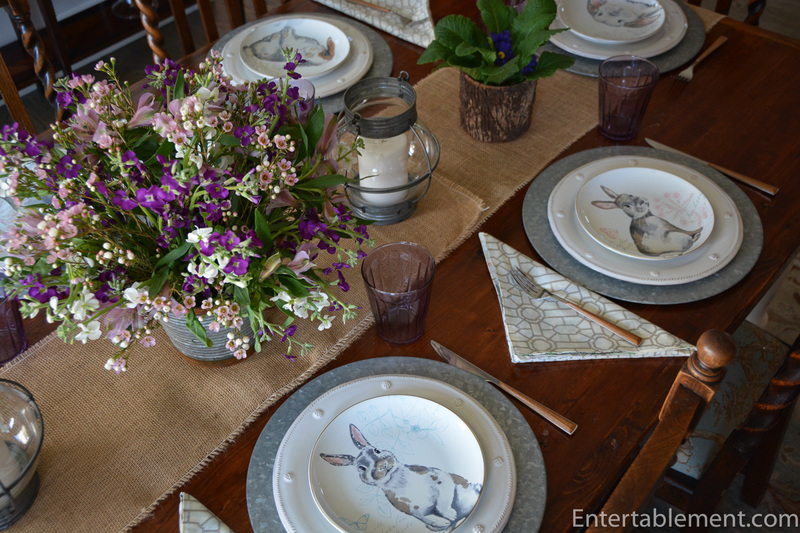 Great springtime table! I hesitated over those glasses and dithered around until they were almost unavailable, thinking “who needs lavender tumblers”? But they’ve had several outings! Maybe try eBay? They often have some ex-Pottery Barn stuff.